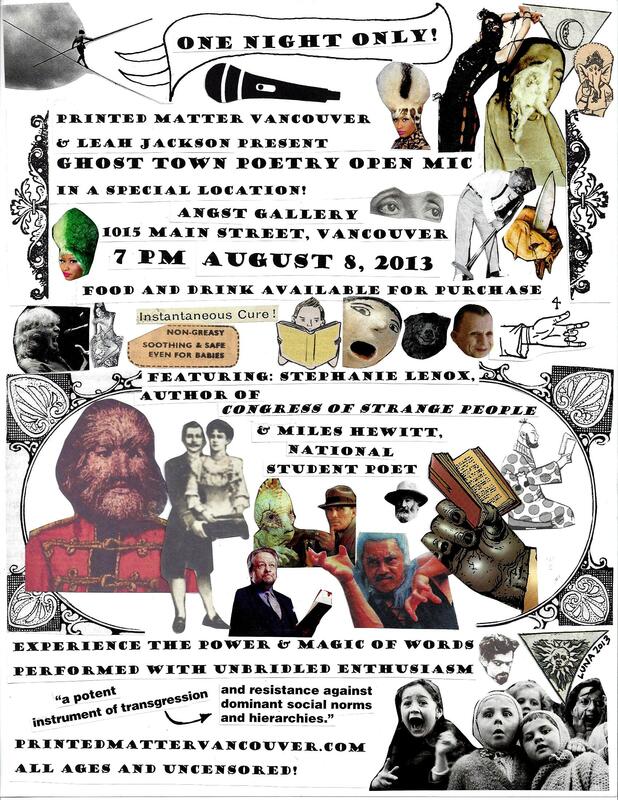 Note: The Ghost Town Poetry Open Mic, which has taken place at Cover to Cover Books in Vancouver since 2007, will take place at Angst Gallery on August 8 because the bookstore is unavailable that night. The series will return to Cover to Cover Books on September 12. Information about Stephanie Lenox from Airlie Press.org: Stephanie Lenox’s inventive debut collection Congress of Strange People entices readers into a “federation of freaks” with voice-driven poems that sing a collective ode to our common strangeness. Employing humor, mystery, and a bold yet generous gaze, this book keeps company with a snake handler and conspiracy theorist, record-holders from The Guinness Book, Miss Manners, human cannonballs, Nancy Drew, and other characters from a family of outcasts. The poet lives in Salem, Oregon, with her husband and two daughters. 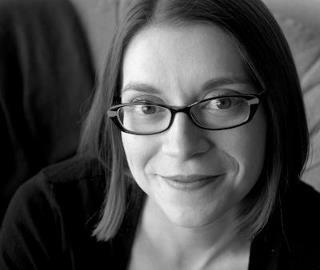 She teaches poetry at Willamette University and edits the online literary journal Blood Orange Review. She is the author of The Heart That Lies Outside the Body, an award-winning poetry chapbook published by Slapering Hol Press. Her work has appeared widely in literary journals and has been honored with fellowships from the Arizona Commission on the Arts and the Oregon Arts Commission as well as numerous nominations for the Pushcart Prize. For more information, please visit her website at http://www.stephanielenox.com. Miles Hewitt is an eighteen-year-old writer of many mediums from Vancouver, Washington. He spends his days crafting poems, songs, and status messages, recording albums in dimly-lit basements, and ruminating. His self-recorded album Empire will be released on August 10th, 2013, at Niche Wine and Art Bar. Recently, he was selected as one of five National Student Poets for the 2012-2013 year by the President’s Committee on the Arts and Humanities, won a National Silver Medal for poetry at the 2012 Scholastic Art & Writing Awards, and serves as a poetry reader for the Adroit Journal, a writing and art magazine managed exclusively by high schoolers and college undergraduates. Miles is considering a career in political communications or speechwriting if the “rock-and-roll-poet” line of business doesn’t pan out. He will attend Harvard University in the fall.